2019 is already shaping up to be a standout year for mobile appsec and secure DevOps. If we can say anything with certainty, it’s that cybersecurity is unpredictable and the wave of DevSecOps is unstoppable. But we foresee intensifying concerns about digital privacy amidst high-profile breaches. Are you seeking to accelerate the delivery of secure mobile apps? DevSecOps is all about letting tools do the work for you. Many DevSecOps shops plug mobile appsec testing directly into the CI/CD toolchain to find and fix vulnerabilities faster. Automate the workflows and tune the testing to meet your needs. Empower devs with nearly zero false positives and remediation details. Break the build when necessary and release apps faster when you don’t. Hear Radare creator Sergi (Pancake) Alvarez conduct a deep dive of r2frida, a framework that combines the best of Frida and Radare. Frida and Radare are leading open-source reverse engineering tools sponsored by NowSecure. Targeting intermediate to advanced users and security analysts, this overview will highlight the r2frida plug-in architecture. + How to create your own new plug-in. 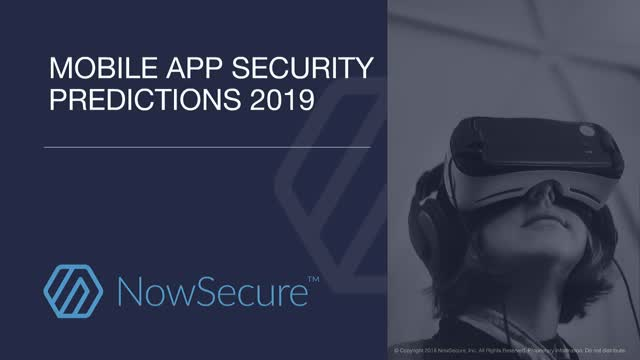 As DevSecOps transformation begins to sweep across organizations, NowSecure set out to take the pulse of the movement as it relates to mobile apps. We partnered with DevOps.com to conduct the industry’s first user survey on the state of web and mobile app DevSecOps. Mobile penetration testing helps uncover app exploits and vulnerabilities and is a crucial component of risk assessment. However, many people fear the complexity and don’t know where to get started. It all begins with a solid plan of attack. NowSecure veterans of hundreds of mobile app pen tests will walk you through the process of assembling a pen testing playbook to hack your app. +How to document findings to close the loop on vulnerabilities. As DevOps teams seek to accelerate the mobile app dev pipeline, they rely on tools and best practices to gain speed. Because our engineering leader Jeff Fairman previously ran software development for a top online brokerage, he understands the challenges of scaling security testing to meet current demands. + How to combine continuous daily testing with outsourced pen testing. Enterprise-grade ephemeral messaging provider Vaporstream knows firsthand that security needs to be built into the software development lifecycle rather than bolted on. Serving highly regulated industries such as federal government, energy, financial services and healthcare, Vaporstream’s leakproof communication platform provides the highest level of assurance that compliance professionals require. Vaporstream partners with NowSecure to test and certify its Android and iOS mobile messaging apps. With 4 million public apps and millions more enterprise apps developed internally, not all Android and iOS apps are created equally. Some mobile apps simply publish information, some have sensitive data and others contain trade secrets. Given the volume and velocity of mobile apps, there simply aren’t enough resources to test them all in the same manner. There has to be a better way. Most mobile app penetration tests or vulnerability assessments take anywhere from a couple of days to two weeks to deliver because of the manual approaches, brittle open source stacks in homegrown testing rigs and legacy application security testing (AST) tools. The shift to agile development common in mobile app development teams has left appsec testing behind. New mobile app builds are pushed daily, weekly or monthly, and appsec testing teams struggle to keep up. Each new build brings new code, including 3rd-party libraries, and with that code comes new potential vulnerabilities. Application security & testing teams - this one’s for you. If you’re looking for ways to join the agile approach and keep pace with the speed of your development team’s CI/CD pipeline, take stock of these 5 tips for mobile appsec testing and integrate them into your company’s workflow. NowSecure - protecting the business at the speed of mobile. From the creators behind top mobile tools R2 and FRIDA, get the inside scoop on the R2 and FRIDA OSS projects. Led by NowSecure Research Team including David Weinstein, Ole André and Pancake (Sergi Àlvarez), this webinar speaks to our favorite mobile AST OSS projects. Peek behind the curtain on these tools, check out on their latest updates, learn how to use them to solve a crackme, and talk about potential future enhancements. Attendees will learn about popular open source projects for AST and walk away with hands-on experience on how to use them and get a peek at the future. NowSecure continuously monitors millions of mobile apps in third-party apps in the Apple® App Store® and the Google Play™ store for security, compliance and privacy risks. A comprehensive analysis of iOS and Android apps found that a staggering 85% of those apps fail one or more of the OWASP Mobile Top 10 criteria. Given that the average mobile device has over 89 mobile apps on it, what are the odds your employees have one or more of the apps and what’s the real risk to your business? During this webinar, renowned mobile security expert and NowSecure founder Andrew Hoog and Chief Mobility Officer Brian Reed will review the massive data set, detail the areas of exposure and review mitigation recommendations. Mobile apps power productivity in the modern business; don’t let a few bad apps bring it down. Note: Live attendees will be entered to win a free mobile app security assessment! To close out the 2017 webinar season, our mobile security expert panel will review the top mobile threats of 2017 (e.g., Cloudbleed, Bootstomp, Broadpwn, and more) and then debate what’s next in mobile app security and mobile app security testing for 2018. Join us for a spirited discussion of the security ramifications of the new iPhone X, iOS 11, Android 8, the latest innovations in the mobile app security testing, and more. Compare your mobile app security and mobile app security testing initiatives with what our experts say should be your top priorities in 2018. Live attendees will be entered to win a free mobile app security assessment! What you don’t know about third-party apps in the Apple® App Store® and the Google Play™ store can hurt you. Apple and Google have app review processes at various levels, but banks and financial services organizations require more scrutiny -- especially for BYOD & COPE devices. Commercial apps used by employees in the workplace can leak data and violate security policies. Third party apps that use your company SDKs or APIs can expose your organization, defraud your customers, and tarnish your brand. Join our webinar to learn how to incorporate third-party commercial apps in your mobile threat modeling exercises and application security programs to protect your organization, your reputation, and your customers. Our threat research team spends every waking moment reverse-engineering and cracking mobile apps and devices to help organizations reduce mobile risk. During this webinar, renowned mobile security expert and NowSecure founder Andrew Hoog will explain the attacker’s point-of-view, what attackers are looking for in mobile banking or financial services apps, and what makes your mobile app an appetizing target. We will then provide tips for deploying a mobile app security testing program to ensure you proactively plug security holes, squash privacy leaks, and fill compliance gaps in your mobile apps. Google released Android 8 (Oreo) recently, and soon Apple will release iOS 11. Both updates include a number of security enhancements. Mobile apps fall in scope for a number of regulatory requirements that govern the banking and financial services industries, such as: guidelines from the Federal Financial Institutions Examination Council (FFIEC), the Gramm–Leach–Bliley Act (GLBA), New York State cybersecurity requirements for financial services companies, the Payment Card Industry Data Security Standard (PCI DSS), the Sarbanes-Oxley Act, and more. Luckily, a repeatable mobile app security assessment program and standardized reporting go a long way in both achieving compliance objectives and securing mobile apps and data. Mobile devices and apps make employees more productive, but deploying leaky or vulnerable apps increases enterprise risk. What does a sensible approach to approving and denying Android and iOS apps for use by staff look like? It starts with accurate, up-to-date security assessment data. Join NowSecure VP of Customer Success and Services Katie Strzempka for a webinar explaining how to take a data-driven approach to evaluating mobile apps for use at your organization. NowSecure delivers fully automated mobile app security testing software with speed, accuracy, and efficiency for Agile and DevOps initiatives. Through static, dynamic, behavioral and interactive mobile app security testing on real Android and iOS devices, NowSecure identifies the broadest array of security threats, compliance gaps, and privacy risks. NowSecure customers can choose automated software on-premises or in the cloud, expert professional penetration testing and managed services, or a combination of all as needed.